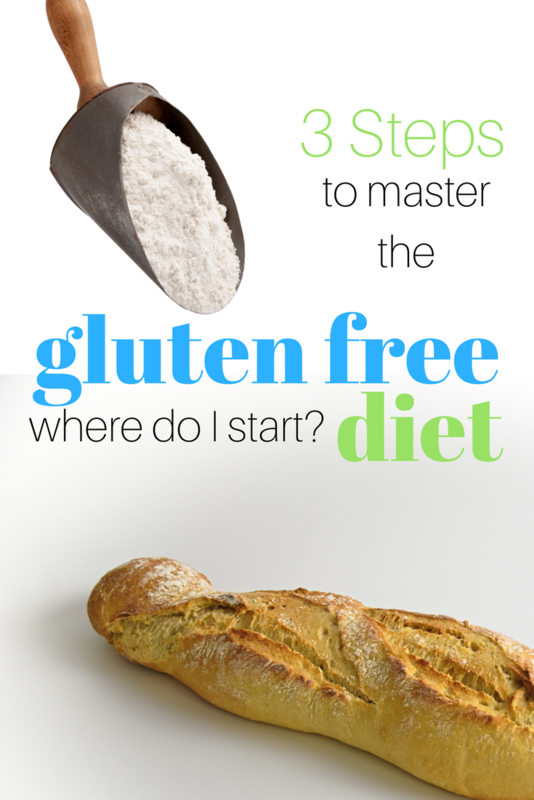 Three tips and tricks to help you go gluten free as painlessly as possible. Finding out that you have a gluten intolerance or Celiac Disease can be a real bummer to say the least. It can feel like the end of the world. Strolling the grocery isle or glancing at a restaurant menu is enough to make you burst into tears and scream, “My life is over!” Maybe you haven’t determined an intolerance or Celiac and are beginning an elimination diet to see if your symptoms improve. Either way, knowing what to do as far as a gluten free diet for beginners doesn’t have to be as stressful as you may think. Thankfully the supermarkets and restaurants are hopping on board with more and more amazing gluten free products. I will say, if you are suffering with some serious tummy troubles or other gluten induced symptoms, supplementing your diet with highly processed gluten free foods is not the best way to go. However, I fully get that it is stressful and you have to start somewhere. The idea of having to give up some of your favorite foods is enough to make a person want to bail before even starting. I touched on this a little with my post Gluten Free Shopping List but today I am going to help you get really start sifting through all the products on the market and start figuring out the cleanest way to start your new diet. 1. Learn exactly what gluten is. People get confused (myself included) when they think about a gluten free diet. Often times it is assumed that it is only in breads and pastas. If not that, it’s assumed that it is in every “junk food.” Neither of these is the case. When I first started my gluten free elimination diet, I failed to skip the soy sauce. I didn’t realize gluten was in one of my favorite condiments. So what ingredients do you have to look out for? For a bigger list of all things gluten free, visit this list on the Celiac.org website. Once you know just what you are avoiding get a feel for the different types of foods out there. The best part is you don’t have to stick to specialty stores like Whole Foods. Gluten free options are in most supermarkets these days. That includes Thrive Market online! Thrive Market has by far the absolute best life saving kit for anyone just starting out on a gluten free diet. They have done a great job of combining some of the cleanest, healthiest food options like Mary’s Gone Crackers and Coconut Aminos as well as some of everyone’s favorite snack options like Mac n Cheese and sea salt crackers. Plus, this kit is 33% off the retail price. Even better, if you have never ordered through Thrive Market, you will get an additional 25% off plus FREE shipping on your first order. If you really want to take full advantage of your 25% off, you can simply head up to the Shop Values menu on the site, an additional menu will appear where you can select different options like paleo, raw, vegan and gluten free. You can literally cater your shopping to your needs. You will see ratings, prices and discounts for each food item. 3. Practice gluten free cooking. Think about some of your favorite meals that included gluten. For me it was pasta and breads. Maybe that seems like an extremely obvious statement. Once I started figuring out which noodles I liked and what baking mixes worked to make some of my favorite biscuits, it was still a hit and miss a lot of times. Figuring out your favorite gluten free noodles can definitely be an experiment, especially depending on what dishes you are cooking. There are black bean noodles, edamame noodles, quinoa, chickpea, lentil, rice noodles…you name it, they have made it. Isn’t that fantastic for those of us just having to start gluten free eating now? We are really fortunate to have such a big variety. It makes it so much easier to ease into this total diet makeover. More often than not, gluten free noodles do not take long to cook and they boil differently than regular pastas. So, to save you the stress, here are a few tips I have picked up on. Rice noodles – tend to stick together. I will drizzle a little olive oil or sesame oil in the water while the noodles boil and do my best to continuously stir them and pull them apart. Quinoa noodles – cook very quickly and will start falling apart if not removed from the heat fast enough. Gluten free noodles – in general may get extra sticky, or get a film on them, because of this, when I strain them, I will also rinse with cold water. It helps clean them off and keep them separated. I’m going to lay it on the line for you guys, gluten free flours are still something I haven’t experimented with too much. When I see that a recipe calls for 3 different kinds of flours and each of those bags of flours costs $8, I tend to shy away from even wanting to bake that recipe. Don’t think I let this stop me from still doing my fair share of baking, I just tend to gravitate toward the ones that are “lower maintenance.” Here are some of my favorite go-tos and biggest lessons I’ve learned. Coconut flour – this is probably the yummiest of the gluten free flour varieties in the sense that it is already sweet in flavor. However, I cannot be an instant supplement for regular flour. Coconut flour thickens up very easy. I once attempted gluten free pancakes and within seconds I had a big, giant doe ball on my hands. So I tried adding more milk…then maybe an egg…then maybe I cried. Coconut flour recipes are great because the flour itself will go a long way because most recipes don’t require a lot of it. Just be aware of it’s thick consistency. Rice flour – Rice flour is probably one of my absolute favorite gluten free flours. I personally feel like it keeps recipes tasting the most like “regular” food. The great thing with rice flour is that you can make it at home but it is a LONG process. I have done it before, but now I opt more for oat flour which I’ll share with you next. If you want to give the rice flour at home a go, here is a detailed tutorial by Padma at masalakorb.com. Oat flour – Most of the time I leave rice flour to my favorite bakeries to make my favorite cupcakes. Speaking of which, they deliver now! Cupcake War winner, Nadia Cakes. They have a great variety of gluten free cupcakes that are literally melt in your mouth delicious. Okay, back to oat flour. This is my favorite to make at home because it is crazy easy. I just take my gluten free oats from Trader Joes, toss them into my NutriBullet and within seconds, I have oat flour. I know a drastic change can seem overwhelming especially if you are one who avoids processed foods or already has other eating restrictions. Working my way toward whole foods while remaining gluten free was definitely a process, but is something I recommend to everyone. Supplementing your diet with heavily processed gluten free foods is never a healthier option. You can read my few steps to cutting processed foods and just remind yourself that this is a step by step process. Happy eating and be sure to check out my recipes page for more gluten free recipes! Love your logo and the tips for going gluten free!